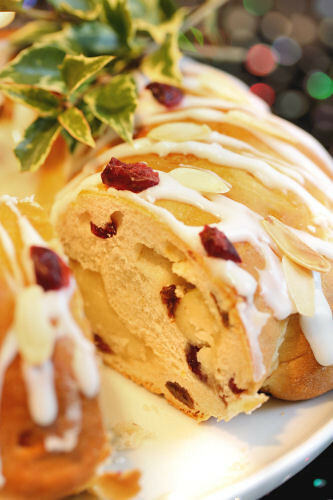 I love making bread, and this one oozes Christmas with its festive shape and ingredients. You can use your favourite dried fruits and nuts, I chose to use a pack of Forest Feast 'Dried Cherries and Berries' and some roasted sliced almonds. 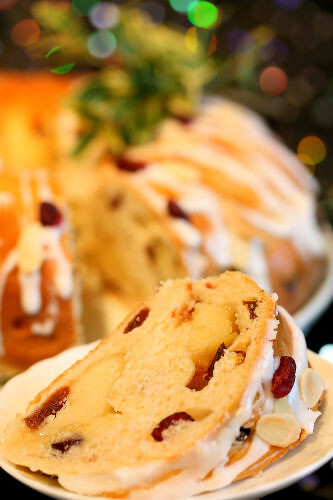 Some Stollen breads have quite a bit of marzipan inside, but I prefer a smaller amount - I grate and spread it over the dough before rolling up. The bread can be made ahead and frozen until Christmas Day, all you need to do is defrost it and pour over the icing on the day. I make the dough in my bread machine, but you could use a mixer with a dough hook or knead it by hand. Only add enough milk to make a soft dough. You can also add spices and mixed peel if you want to make a strongly spiced bread. Put the first 9 ingredients into the bread machine, in the correct order for your machine (not the toasted almonds). My machine has a raisin dispenser, but you can add the fruit on the final kneading if your machine doesn't have one. When it comes to the milk, you may need less or more, keep an eye on it and add as necessary to make a smooth, soft dough. I like to weigh the egg and then add the milk to come roughly to 360-370ml in total. When dough is ready, roll into an rectangle, roughly 15cm x 40cm. Spread the marzipan evenly over the dough and sprinkle with the roasted almonds, reserving a few for the top. Roll up as if rolling a Swiss roll, from the long side. Shape into a circle and join the ends up by squeezing them together. 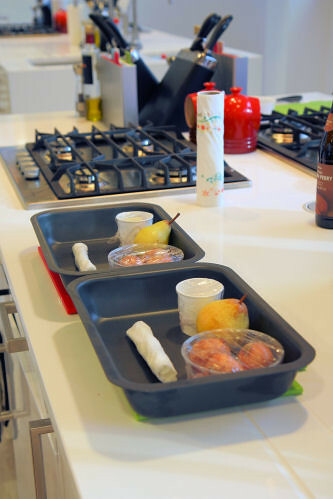 Place onto a greased baking tray and leave to rise until doubled in size. Brush with beaten egg and bake in a pre-heated oven 180ºC/350ºF for about 25 minutes until golden brown. Transfer to a wire rack to cool. 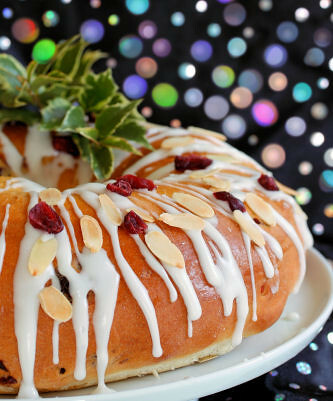 Add lemon juice to the icing sugar until it's just runny, pour over the bread and decorate with the cranberries and reserved sliced almonds. This is my entry into the Most Wanted Yule-Blog Bake Challenge competition from VoucherCodes 'Most Wanted' magazine. All you have to do is bake something Christmas themed to be in with a chance of winning a £150 John Lewis voucher. Entries must be in by today, Monday December 13 2010. You can submit your entries by emailing entries@vouchercodes.co.uk or post your entry up on your blog and email them to let them know it's there. 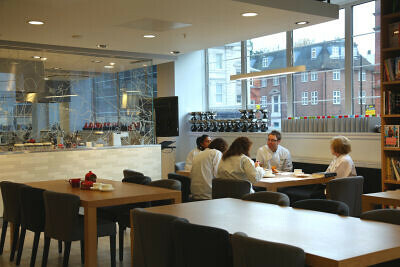 Last week I had the good fortune to attend the newly opened Waitrose Cookery School, and I was extremely impressed. 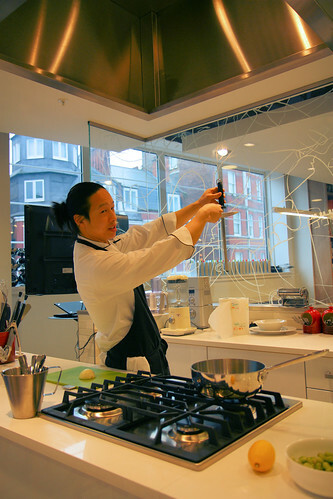 Conveniently situated above the large John Barnes Waitrose on Goldhurst Terrace, London, the beautifully kitted out and scrupulously clean state-of-the-art cookery school is open to everyone. They welcome the absolute novice to the nouvelle cuisine expert. Run by an impressive team of chefs with a wide variety of experience including a range of top UK restaurants, cookery schools and TV programmes. Between them, they have achieved a number of Michelin stars and are always keen to share their knowledge with cooks at every level. I chose to take the one day 'Dinner Party Tasting Menu' course and was welcomed on arrival by Gordon McDermott, the school course manager. There was tea, coffee, pastries and warm croissants in the lounge area while we settled in and met the other people who were attending. After changing into chef whites, we had our first demonstration of the day. 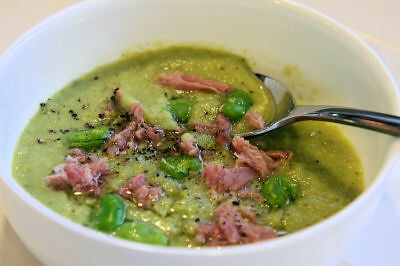 This was with a talented chef, Wilson Chung, who showed us how to sharpen our knives and to use them properly before demonstrating the first dish, hearty ham and broad bean soup. 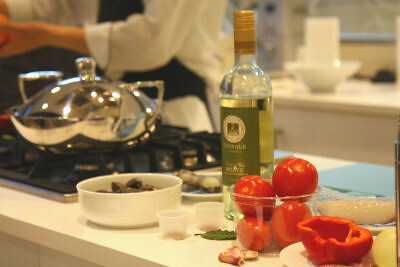 We eagerly made our way to the cooking stations and started to make our own soup. There is a large screen at the front with the recipe, if you should need it to remind you. 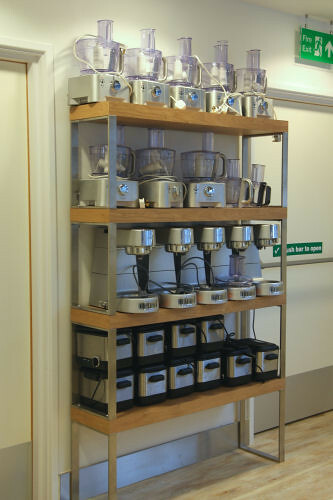 All the ingredients are already weighed out and the equipment is ready for you. 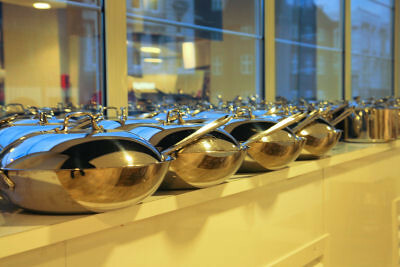 Once our soup was ready, we could eat it before the next demonstration. During the demonstrations, your work area is cleaned and tidied for you (how I would love this service at home!) and your next set of ingredients is laid out. 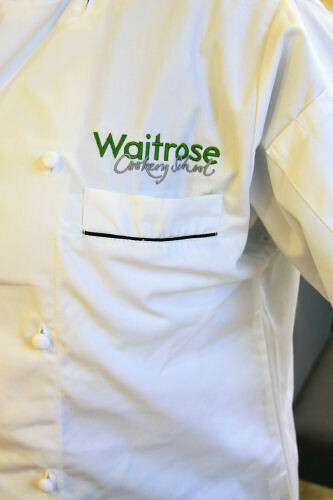 The staff are very accommodating, even popping down to the Waitrose below to get alternative ingredients for the people on the course who had allergies to certain foods. 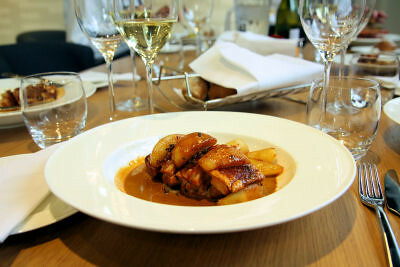 We went on to make a delicious thyme-roasted pork with pan-fried pears & perry gravy, plus a chorizo stuffed squid dish. We ate our lunch in the relaxed dining area and had plenty of time to chat with the chefs and other attendees. After lunch, we had another demonstration from Wilson Chung, who showed us how to make a fabulous Spanish seafood stew, with Catalan toast & kumquat butter. 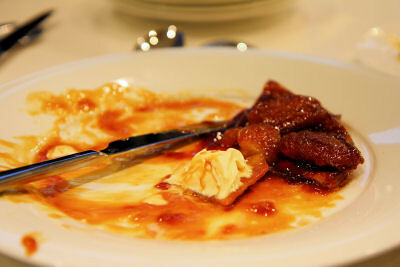 This was followed by pastry chef James Campbell demonstrating an apple tatin with clotted cream. I was wishing there had been a one-day dessert course after this presentation, learning more about caramel and sugar would have been brilliant. During the demonstrations, the chefs welcome any questions you may have, and I bombarded them with quite a few! 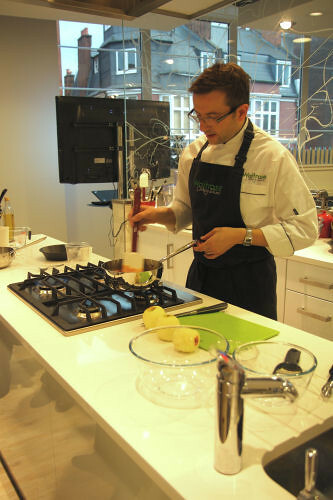 They go out of their way to make sure you have a great experience, with plenty of cooking hints and tips. 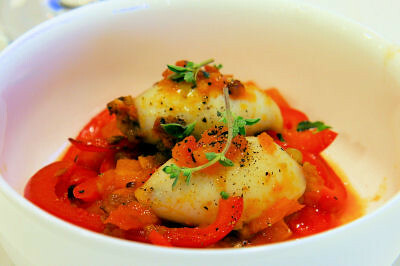 You are never rushed and there is always a chef on hand to guide you. 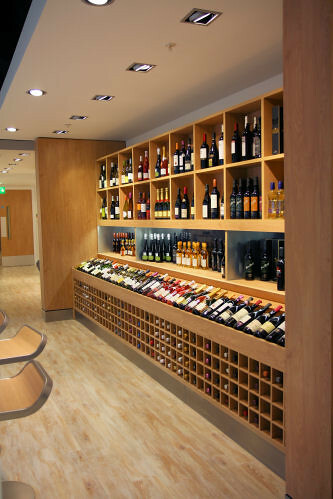 The food is paired with wines and sherry, and all the ingredients can be bought from Waitrose if you want to make the recipes at home. We were given a folder which had all the recipes that we made, plus some extra essential recipes and a glossary. All the ladies who were on the course said they would come back to do another course, and one even went on to organise a special cooking day for her work colleagues. The apple tatin was gone before I could get a photo! 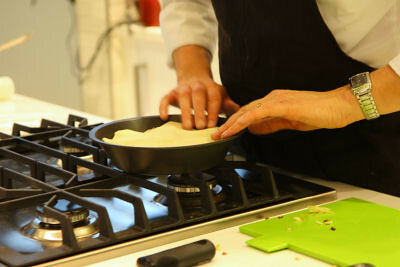 The cookery courses are perfect for everyone and would make a great present for a food enthusiast. One lady who attended had been given the one-day course as a birthday surprise from her husband - she hadn't even known she was coming until she was dropped off at the door! She thoroughly enjoyed herself as did I. I must admit to being a little nervous on arrival, not knowing what to expect, but there was no need to be as everyone was friendly and keen to make sure we had a wonderful day. There are plenty of courses to choose from. As well as the one-day courses there are half day morning and evening courses, plus special demonstration evenings (£65). 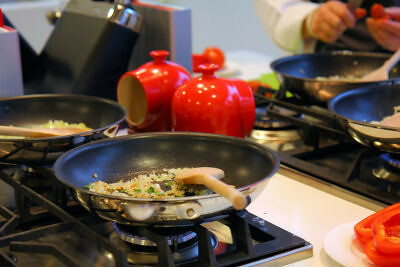 Some of the one-day courses (£175) include bread making, the art of Michelin star cookery, fish & seafood and Thai cookery. 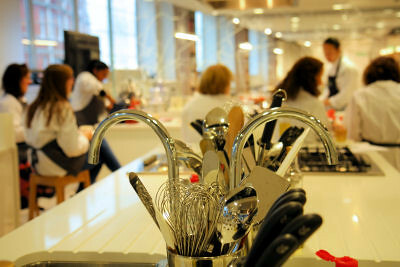 Half day courses (£105) include cupcakes, macaroons, inspiring tapas, canapes & cocktails plus Japanese cookery. The school is planning to add many more courses in the New Year, so there will be something for everyone. 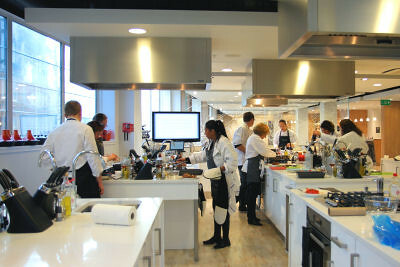 Have a look at the Waitrose Cookery School website for a full list of all the upcoming courses. There is also a short video on what to expect from your day at the school. 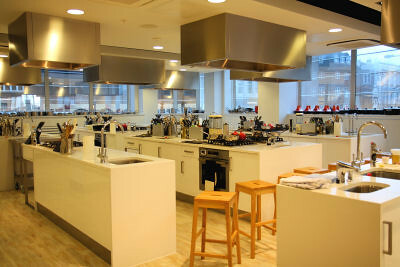 Many thanks to Margot Parker at Waitrose Cookery School, and to Nancy Wainscoat at Z PR London for organising my one-day course.